It seems to me that innovation in the medium of polymer often resembles our own adult version of “telephone.” One artist comes up with a great concept, something she just has to tell a colleague about. In a rush of excitement, that second person passes along the original idea, inevitably adding a personal twist or two. A week later, after a dozen Ma Bell or email retellings, the plans for some fantastic invention have been launched out to the artist’s community. The evolution of the tube bead cutter followed this model. 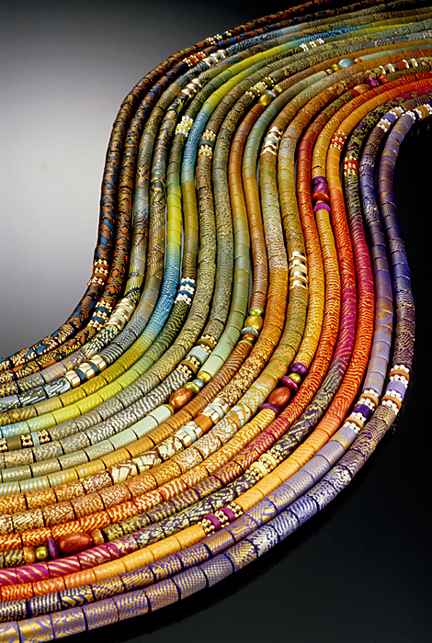 In 1995, Laura Liska visualized a tool that would help her cut heishi-style spacer beads. In May, at the NPCG Shrinemont retreat, she introduced her design using 4″ wallpaper scraper blades packed into a frame of polymer layers. The tool created a sensation at the retreat, and Laura was literally set upon to give impromptu demonstrations. A month later, Lindly Haunani came to visit me, and my fascination grew as Lindly described Laura’s device, with the added precaution: “but every one of Laura’s fingers were wrapped in … Band-Aids!” It seems that in order to get these blades to stick to the clay, Laura needed to clean away the machine-oil film that covered each razored edge. Hence her battle wounds. I noticed that the sample blades Lindly had brought along for demonstration were perforated with oval holes. That led me to the thought, “there just has to be a better way.” In a flash we were off to my local family hardware store, an old-fashioned mom-and-pop operation where they actually took pride in providing helpful, courteous advice about the hundreds of hardware gizmos they stocked. Before my first stumbling, head-scratching questions were able to tumble out, the old veteran in the store put me out of my misery with, “OK, just explain to me what you’re trying to do.” Thanks to that focus, I described my own version of how I thought a tube bead cutter could be constructed. Together, we quickly hunted out drawers containing threaded rods, and then on to boxes of nuts to go between the blades; not functional, the nuts proved uneven. That led us to open little drawers with small box dividers filled with tiny nylon spacers of various sizes. To this day, that hardware store man still can’t tell me what other people use those spacers for. Perhaps some engineering genius designed them just for me, knowing one day I’d incorporate them into a gadget for quickly cutting precision tube beads while keeping all fingers and nails intact. With those parts in hand, Lindly and I raced back to my house where fifteen minutes later I had assembled my first tube bead cutter. Thus was born the very implement I continue to use today. Millions of beads have passed through those blades. And of course Lindly made her own important discover that day; but I’ll leave it to her to narrate that story on her own.